I love hearing the phrase “welcome home” every time I visit a Disney Vacation Club Resort. It makes me feel like the cast members are truly glad I’m visiting (I wish someone would greet me like that every time I return home to my place). Disney Theme Park Merchandise recently welcomed a new assortment of Disney Vacation Club Member items. The introduction of a re-imagined Disney Vacation Club logo last year was a driving factor in creating these items. Product Developer Lindsay Voigt told me that guest feedback also played an important role in the development process. Lindsay said that members were looking for a few things when it came to merchandise including subtle branding, simplistic left chest embroidery, polo shirts and jackets. Disney characters like Mickey Mouse and Tinker Bell were also important. Lindsay worked with Bob Holden from Disney Design Group to create a “key” piece of artwork featuring Mickey Mouse. A variety of items use that artwork including shirts, mugs, automobile magnets and more. She said one of her favorite items was the hoodie which has that subtle logo that members were seeking. Other favorite items with members are Disney pins. We first introduced an annual collection of pins in 2004. This year’s collection features an open edition pin shaped like a key. There is a series of four limited-edition pins that have a “vacation your way” theme. 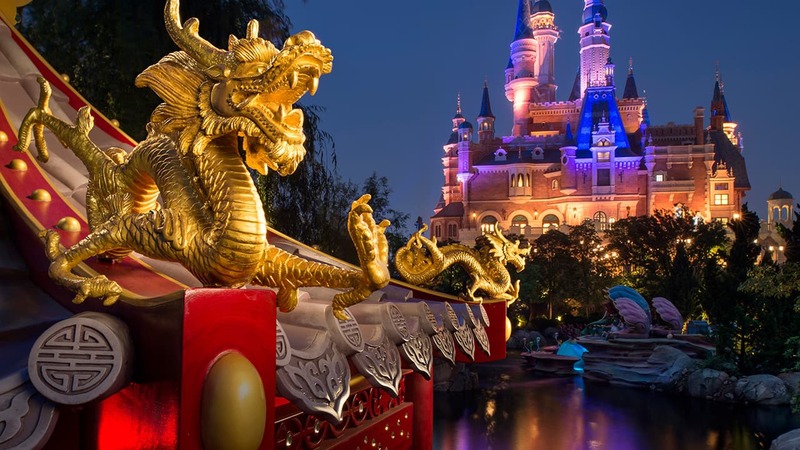 Jeanne Lewis, developer for Disney Pins, said that she was inspired by 500 Member Getaways vacation options across the globe for members. A new limited-edition pin will be released in February, May, August and November. Finally, Lindsay shared with me four new merchandise logos that were designed by Bob Holden and another artist named Jeff Granito. I love the vintage style and colors used in these logos. Bob said he purposely chose pie-eyed Mickey and Minnie to match the vintage style of the logos (that’s awesome!). Look for this artwork to be used on items arriving this spring. This is amazing we don’t have a specific webpage for members to purchase items. We love the stuff and all the better for Disney to use as free advertising!! PLEASE help us get this!!! I LOVE all the new DVC merchandise. Can’t wait till June when I go “home” to get some. 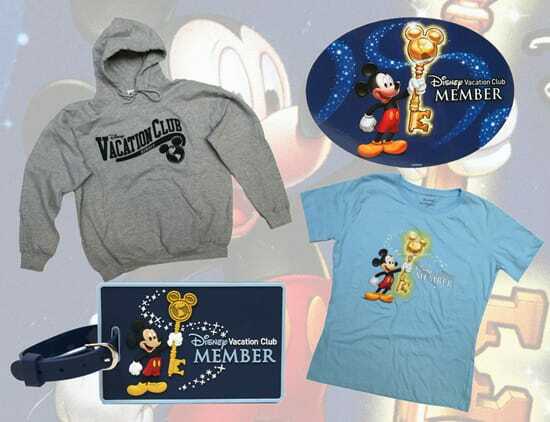 You can list me and my family with all the others who would love to see DVC merchandise available to purchase online. The subtle new design is even something my husband would wear ;)! It would be nice to be able to buy some of this online. Since everyone is asking for the moon, I might as well chime in for all the guys with monkey arms who need to wear “talls” and ask that this be passed along for consideration. 3/4 sleeve jackets on me just don’t look good. 🙂 Thanks. It’s about time DVC recognizes the market for more DVC apparel. I have a BVC pull-over anorak and when I wear it to WDW someone ALWAYS asks, “Where did you get it?” I like where you’re going with this so far. Bring on more DVC resort specific apparel and I will buy it for sure! Really like the new T shirts. For that matter, I really would like to see more resort-specific merchandise in general!! I bought a sky blue v-neck Poly T shirt over Xmas which was really nice. I also saw some nice coffee mugs as well. Glad to see you are going in this direction. Resorts are just as much of a vacation destination for us. In addition, love the resort postcards in the gift shops. Didn’t see one for the treehouses. I am not a DVC member, but had the opportunity to stay in one just before Xmas and it was the best. Thanks for this option!! I am another person who would love to see a store on the DVC website!! I saw a number of new items the day we were leaving SSR, but didn’t have any more room (or money!) for it at the time. Would love to go to the DVC site to shop when I was able! I’ve mentioned it to DVC folks before – surely there must be a market for that, with all the happy DVC members out there? I too would like to purchase these on-line. Can we still call the giftshops at the resorts and order directly from there? @Angela – The resort specific merchandise won’t arrive until May but you should be able to find the majority of other items and your Disney Vacation Club Resort. Lindsay said that most of the items have arrived (a beach towel should be arriving soon). @Santrina – I hope you had a great trip – the weather has been great down here recently. Thank you for the feedback as I have shared it with Lindsay. Rob and I are liking the new merchandise as well! Thanks Steven! I’m with several of the above members asking about the merchandise/store on the DVC site. I would like to have the chance to buy things in the years between Disney trips which works out to every 3 years. I agree…there should be a separate area on disneyshopping site or directly from the DVC members page where we can purchase DVC & resort merchandise. It would be so handy. I just wish that they made the Tee Shirts in a 3x & 4x for women. I was just at Disney’s Boardwalk Villas for my yearly girls week and they had a beautiful Tinkbell DVC T-shirt in the sundries store. Of course the sizing stopped at 2x. Does Disney not realize that some of it’s DVC owners are bigger women. Really I feel a little disappointed that I can’t buy a DVC t-shirt. How can I show the pride? I still wish this was available online even if not in the Disney store ONLINE. But if I had to go threw the Disney Vacation Club Sight to purchase it, I would do so. I hope you’ll be adding new BWV stuff soon too. We’ll be going there for both the Flower & Garden and Food & Wine festivals this year. I sure hope there’s some cute new BW merchandise by at least October if not by May. Is there anyway we can find out what’s available online even if we’d have to purchase over the phone? I’d love to surprise my spousal-equivalent with a shirt before we go. His old Boardwalk shirt is getting pretty tattered. @Erin – I asked Lindsay who said that some new items were recently introduce for Boardwalk. I also know that some new Beach Club Resort logo merchandise is coming in March. At this time, there isn’t a comprehensive catalog of items. I’ll see what I can do to feature additional development in a future Disney Parks Blog article. 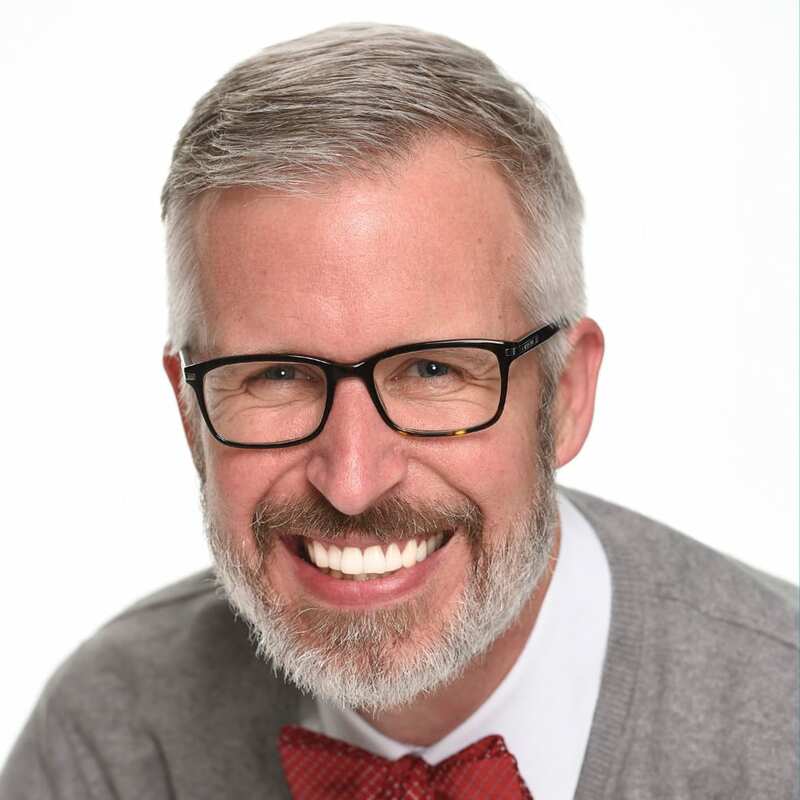 Thanks, Steven, for the pictures! Very excited to see some new DVC items! And happy also to see Mickey on a Saratoga product. I have been collecting DVC magnets from all of our home resorts (Beach Club, Animal Kingdom Lodge and Saratoga) but was very surprised that I couldn’t find a “Disney-fied” Saratoga Springs magnet. Can’t wait for our Easter 2012 trip! We are going to Disney World next week and I would like to buy some of the shirts. Where can I find them? Why can’t the DVC website have a “merchandise” area… that way we can buy stuff between trips! Love it all! I can’t wait to get mine. I agree we should have our own store.. Great idea! I love DVC merchandise! I only wish that we had our own private area on the disneystore like D23. Why is that? I haven’t seen any BLT merchandise at all the last few trips. I hope they release some annual passholder merchandise again. There hasn’t been anything available for the past few years. @Noreen – At this time, there are no plans for Bay Lake Tower merchandise. Sorry I don’t have better news. I realize why you wouldn’t want these items for sale on the regular online store, but one thing that would be kinda cool would be to have a featured item or two every month in the DVC Members Account login area. 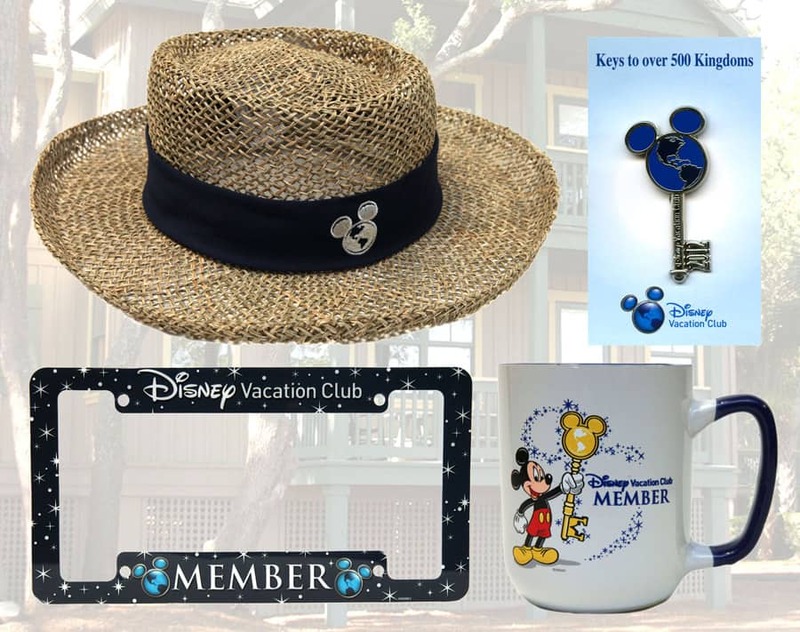 We could login and find the month’s featured item… a DVC coffee cup, a DVC pin, luggage tags, a t-shirt, or something. The new stuff is very, very nice. Very excited for it… just gonna be a while till I get there to buy it. I definately would like to see polos with both resort specific logos and the main logo. I used to have a Beach Club Villas polo that got ruined on my way down to WDW. That year many of the DVC resorts had resort specific polos. My goal had been to get one each trip from the DVC resort that I stayed. I also was able to get a generic DVC logo polo from AKV but haven’t found any on subsequent trips. I can’t wait to get to Vero Beach this summer just to get that adorable Minnie! 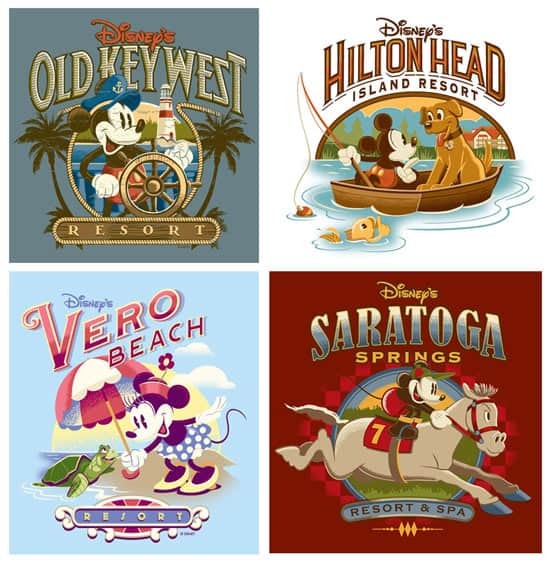 Steven I like the 4 new logo designs for those resorts are there plans to do that for each DVC resort? We would like to see the return of baseball caps as well. We have made many trips over the past couple years and have always looked for DVC hats to no avail. Please bring those back. I love the new DVC merchandise! Is there any news about the Pan Am style totes becoming available? @Michelle – I know there is a baseball cap that says “Disney Vacation Club” across the front. I love the Saratoga Springs shirt! Over past 5 -7 years the DVC merchandise has really needed some improvements. Thank you for this posting. I am very excited for this great merchandise and I hope these pieces sell as well as I think they should. I love the merchandise themed to the DVC resorts. My home DVC is VIllas at Wilderness Lodge, and each time we visit, we buy something new with the logo. Cannot wait to see a vintage style logo T-shirt for VWL. Looking forward to collecting this year’s DVC exclusive pins! Thanks for the great stuff! Glad to hear that they are looking at polos with the logo. I was just at the parks and was disappointed in the lack of any polos with subtle logos. Any chance some of this might be available online? @Andrea – I asked the Vinylmation team who said that additional DVC figures are coming. They showed me two additional figures that were recently sampled. I unfortunately don’t have an ETA as to when they will arrive. Keep watching Vinylmation.com as we will post the date as soon as we know. I am happy to see new DVC merchandise available! Any word on a new DVC vinylmation anytime soon? Thanks! Looks great! I assume this stuff is only available at the Parks? I love love love the resort-specific images! I’ve already got the Saratoga Springs and the Old Key West t-shirt. I hope other people love them as much as I do, so that you’ll make MORE pie-eyed Mickey & Minnnie resort-specific merchandise!